We Don’t Need No Stinking Pitch Counts! Back during the halcyon days of my childhood, I thoroughly inspected the front and back of every baseball card I added to the collection. 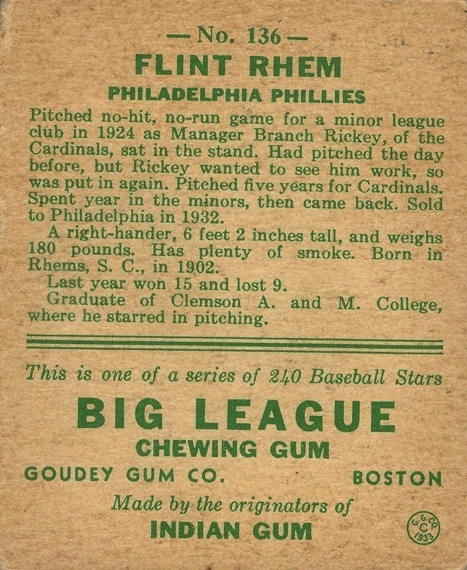 The pictures, the stats, the cheesy cartoons Topps would sometimes place on the backs, the pithy summaries of the player’s career or some memorable game/season — none of this stuff escaped my attention. Of course, this was a lot easier to do back during a time where there were only three major sets during the year. In my adult years, I started paying far less attention to the backs. The primary reason for this is that as I got older, it started feeling like the manufacturers were treating the backs more and more like afterthoughts — especially as the proliferation of sets took off in the early-to-mid ’90s. 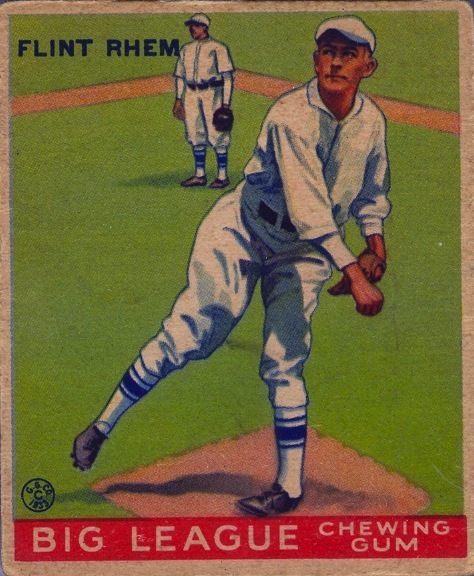 With a name like “Flint Rhem,” it’s not surprising that he went out there two days in a row. He sounds exactly like the type of old-timey player who would have gone out there a third day and just kept throwing until his right arm fell off. If he had lived into his 90s, he would’ve been in rocking chair on the front porch of a nursing home, telling anyone who would listen about how today’s pitchers were too coddled, his reminiscences of pitching a no-hitter on no rest, how he must have thrown over 300 pitches on those two days, how he could get on a mound today and strike out Steve Jeltz on three pitches, and that it was a travesty that Chuck Klein wasn’t inducted into the Hall of Fame until 1980. Okay, one part of that last sentence is probably a stretch, but I’ll leave it to you to decide which part it is.